Scentsy just announced that come March 1st, we will offer two new Kids Diffusers. KIDS DIFFUSERS AND 100% NATURAL OILS Dazzle them with a magical, multi-sensory experience. 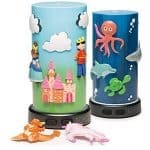 Kids will love creating playful scenes on their very own diffuser with colorful magnets. NEW 100% Natural Oils in kid-friendly scents are perfect on their own, or mix them with other Scentsy Oils to create your own fairytale blend. Kids will love that they can rearrange the magnets to create their own fairytale.